The following instructions are intended for users who are already familiar with the basics of handling the iCathedral App and who are interested in more in-depth topics regarding this app. If you are using iCathedral for the first time, then please refer to the introductional chapter of this manual first. Before creating new presets, see: How to create senseful presets it might be helpful to know the sound characters of the different stops. We list them below. Stops with labial or flute pipes (sound produced similar to a recorder). These stops create more or less soft tones. 8' basis: F1-Flute 1/ B-Gamba/ Cs-Vox Celeste/ Sc-Salicional/ TP-Gemshorn/ TU-Unda Maris. Stops with lingual or reed pipes (sound produced similar to oboe or clarinet). These stops create -with the exception of the clarinet - more or less sharp tones. These stops are combined by at least two different single stops. These stops are recorded by an organ of a small chapel. Each stop was and is divided in two zones, divided by G 3 and G sharp 3. Therefore we recommend to assign these stops Omni MIDI channels. These stop buttons call combinations of two or more buttons. These combinations are originally recorded from the referring organ. In this way it means only one single stop for the operating system. Therefore the polyphony load will be low when using these stop buttons. Not forgetting the Bells: You find them at G-Bells. For creating a new preset tap on the cabinet button, shown on the left. The cabinet screen opens and shows all available stops. See picture "1". It may be helpful to study firstly the hints of How to create senseful presets. The active stops of the actual selected preset are shown with a partially pink border. Tapping on a stop symbol will enlarge it. See picture 2. Turning it clockwise will start the sound of this stop and enhance its volume, turning it inverse will reduce its volume and finally switch it off. Please note that at every change of volume you have to strike the keys again, otherwise the volume changes will not become audible. After having created a new stop combination you should firstly assign the MIDI channels as shown at Assigning different MIDI channels to a preset. Leave the cabinet for this aim by tapping on the arrow symbol shown on the left and call and use the MIDI mapping screen as explained above. Perhaps subsequently you have to adjust again the volume of some stops in the cabinet area. Tap on the + symbol. See picture 1. An input windows opens. Tap on "New Performance Preset". See picture 2. A new auxiliary windows opens. See picture 3. Fill in a new preset name, a new program number, a MIDI MSB number and a MIDI LSB number as explained below. See picture 4. Subsequently tap on "Create". Now the new preset will be listed. You are free to give a new preset any name, but please avoid duplicates. The system accepts duplicates, but duplicates could cause confusions. This also applies to the program numbers. All presets become listed with consecutive numbering. This means: In case the actual preset list contains for example 22 prests and you edit a new preset with the program number 31, the new preset will be listed as No. 23, independent of its program number. The MSB number can get a value between 1 and 128, the same applies to the the LSB number. Program number, MSB number and LSB number can be used by experienced users for calling different presets by MIDI messages, e.g. MIDI messages being sent by a keyboard. Maybe you will never use this feature, nevertheless please avoid duplicates of MSB and LSB combinations. Enter for instance the following values: MSB 3/ LSB 0, MSB 3/ LSB 1, MSB 3/LSB 3 and so on - or MSB 4/ LSB 0, MSB 4/ LSB 1, MSB 4/ LSB 2 and so on. If any you will detect a duplicate: Open the respective preset, correct the entries and save the preset by a new name. Then open again the old incorrect preset, tap on the red x symbol for deleting it and confirm the query. Creating a new organ registration or - with other words - setting a new preset can be compared with the art of building a sound pyramid. Begin with the basses where you should create a solid sound fundament by selecting for instance the 16' Subbass gedackt combined with suitable 8' stops, e.g. Flute 1 or/and the Quintbass. The descant zone could contain further 8' stops, followed for instance by a Mixture or/and the 4' Octave or/and the 2' Superoctave. Using sharp sounding stops (e.g. 16' Trombone or 8' Ophikleide) for the bass section is possible, but you shouldn't combine them with soft sounding stops in the descant. On the other hand very soft sounding stops like Salicional or Clarinet are not recommended to be used as bass stops. Apart from that applies: Feel free to make experiments, follow your ears and your personal taste. Back to: Create a new preset. You may add a reverb audio effect to your sounds with the controls shown below. A reverb effect simulates the sonic reflections in a certain type of room. Tapping on "Effect" at the effect combo opens a list of different reverb effect types, from very small rooms up to huge cathedral halls and tunnels. There are also some rather articial reverb effect types which provide reverberation times that don't exist in nature. Especially electronic music genres often use such kind of articial effects to add a very deep "ambient" feeling e.g. for slow tempo songs. You may use such effects for fun, nevertheless for a sacral organ reverb simulation the conservative reverb effects are more adequate. Control the intensity of the actual reverb effect by turning the turning knob clockwise for a higher intensity or inverse for reducing it. By selecting "Off" - this is the first entree at the reverb list - you can also disable the effect completely, in case you prefer a completely "dry" version of your sounds. You might want to do so for example if you are routing iSymphonic's audio output into a separate third-party audio effect app instead. You may also disable the audio effect simply to save CPU resources on your iPad. iCathedral automatically connects to all external MIDI devices (e.g. keyboards, foot switches, slider/button controls) attached to your iPad. So there is no software configuration required to receive MIDI data from your external MIDI equipment. You may encounter that the number of external MIDI devices is showing 1 even though you have no external MIDI equipment attached to your iPad at that moment. This is not an error. Usually that means you used iOS's so called Network MIDI feature before, which will remain visible like a regular MIDI hardware device for the entire system. In such cases, when you attach one external MIDI keyboard, the number shown should thus be 2. This feature optimates the tuning of iCathedral and thus its sound. The background is: Equal Temperament, which is commonly used by keyboard instruments, presents acceptable fifths, but its thirds are quite detuned. This leads to undesired acoustic interferences: Major triads - in particular - sound sharp and weak. For sacral organs it is common to use inequal tuning tables with better tuned thirds in the middle of the fifth circle, e.g. at F-major, C-major, G-major. But this act leads to still inferior tuned keys with more accidentals. In contrast to this, musicians as members of string and wind ensembles or of qualified choirs are educated to fine-tune their tones dynamically. They shadow upwards or downwards the pitch of the performed notes according to their harmonic function. In this way they get a tight approach to just intonation. Call Hermode Tuning by tapping on this button. 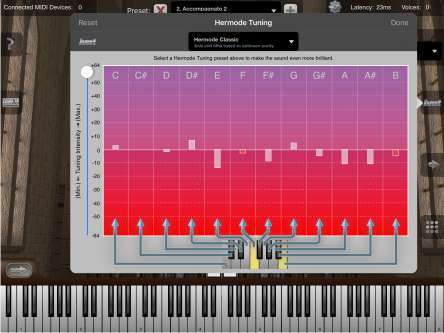 The Hermode Tuning window opens. In default Hermode Tuning is disabled. Now you can select one of two different settings. "Hermode Classic" controls fifths and thirds to just intonation. "Hermode Pop/Jazz" controls additionally the diminished seventh, e.g. the F in the note-constellation G-B(german H)-D-F to a so-called natural seventh. This sounds also great at classical music but the frequency position of this natural seventh is very deep so that audible retuning steps can occur e.g. when playing legato F-A-C to G-B-D-F.
For calling a Hermode Tuning Mode tap on "Disabled". An additional list opens. Now tap below either on "Hermode Classic" or on "Hermode Jazz/Pop"
In case you want a less perfect tuning with slight beats in multivoiced music, you can change the intensity of tuning correction by the white slider on the left assigned to a scale from -64 to 64. "64" means full correction, moving it to "-64" means "no correction" or "equal temperament", "0" calls a value of 50 % correction and "25" calls a value of 70 %. If you switch off your iPad and switch it on again Hermode Tuningwill be set to "Disabled". In such cases you have to renew the Hermode Tuning settings. The Hermode Tuning algorithm is consuming hardware resources. With very old devices (e.g. iPad 1) this may lead to performance issues. If you encounter any issues, then please disable the Hermode Tuning algorithm on such devices. Simply tap on "Disabled" on the Hermode Tuning window. For more recent iOS devices there should be no negative impact using Hermode Tuning. The amount of voices in use are displayed in real-time on the very top right of your screen. For controlling its setting tap on the setting symbol. The setting window opens. By default automatic polyphony is turned on (see the slider position, shown on the left). 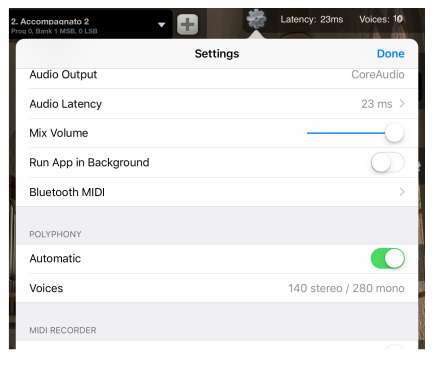 That means the app tries to find an appropriate maximum amount of voices for you, depending on various factors, for example the exact iPad model being used, the currently selected latency setting, but also depending on whether you are using certain effects or are using Inter-App Audio mode. Because there are a variety of factors that have an impact on overall resource consumption of your device and thus the maximum amount of voices your device may handle depends on numerous circumstances. Due to this it is recommend to leave the app in automatic polyphony mode. 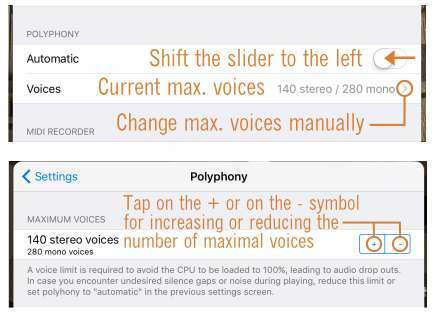 As long as automatic polyphony mode is on , the "Voices" row from the settings screen is read only, that is it will only show you the currently selected maximum polyphony as being decided by the app for the moment for you. There is always a certain amount of delay involved when playing with an electronical instrument. The time that passes between triggering a note on your keyboard and the time when you actually hear its result on your audio speakers is called latency. In a digital system - like with this app - the amount of latency is mostly defined but the digital audio buffer size the system (or app) is working with. This is configurable, and hence its latency is configurable. If the overall latency is too high (that is if the delay is too long), then it will obviously have a negative impact on your playing. On the other hand, when using a very small latency setting, this comes with a price: The digital system has to work with tiny buffer sizes and CPU usage increases substantially; not anti-proportional to the buffer size, but in fact with complex digital systems (like this app) even exponentially. As a result, the maximum polyphony that may be delivered with your device shrinks substantially with smaller buffer sizes. 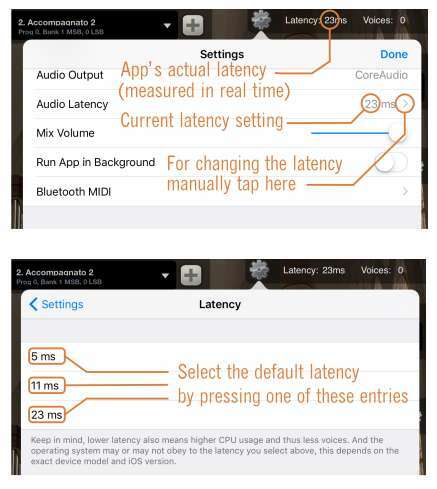 Most musicians are fine with a latency of 23ms, and that's why this is the default latency setting with all our apps. There are however also some musician who are very sensitive to even lowest latencies of less than 5ms. So as a musician you have to make a trade-off and decide by yourself what an appropriate latency is for your playing style. How much latency can you bear, how much polyphony do you need, and how much resources do you probably need for other apps running on your device at the same time. You may configure the amount of latency on the settings screen of iCathedral Organ, as shown on this screen shot. Subsequently go back to the setting window by tapping on "Settings" or go back to the main screen by tapping on the Setting symbol. On the very top of the main screen you can always read the current latency of the app. This value does not simply display the latency setting you selected, instead it always displays the real, effective latency as measured by the app in real-time. So it adds additional control whether the latency is actually the one desired by you, and whether that latency is stable (that is retaining at constant latency amount). By default this app will automatically be suspended (stopped) whenever you press the home button at your iPad, or when you switch to another app. Sometimes you may want the app though to continue running in the background, for example when you are using another app to display scores while you are playing orchestra sounds on your keyboard with iCathedral Organ. To do so, go to the settings screen of this app, which you can reach by tapping on the small gear wheel icon top right on the main screen of this app. At section "Audio / MIDI Driver" you find a switch called "Run App in Background". Enable this switch to keep the iCathedral Organ app running in the background, even when it is not visible on the screen. You do not need to enable the "Run App in Background" setting when using this App in either Inter-App Audio mode, JACK mode or Audiobus mode. In those modes the app will automatically continue to run in the background, and as soon as the app is no longer used in one of those three modes, the app will automatically stop running in the background. So the mentioned setting here is just intended to control the background running behavior while using iSymphoic Orchestra as stand-alone audio app. You should disable the "Run App in Background" setting as soon as you don't need the iCathedral Organ app anymore. Otherwise it will constantly reserve hardware resources and may drain your battery. Refer to the MIDI Recorder manual for information about the built-in MIDI Recorder of iCathedral Organ.